Caudalie already had a few product launches this year but their latest one, a line of four products called Resveratrol Lift, is its most impressive, as it promises to plump & firm the skin. The products were launched in September and having tried all four but physically tested one, a serum, I am suitably impressed that the promise and the result align. In some ways the process of ageing can be compared to crumbling. We start with perfect, natural faces and glowing, supple skin but with the passage of time and in part due to lifestyle, environment and ageing process we loose things that we initially take for granted – the volume and the firmness of the skin. Caudalie, when creating those products, was driven by the notion that skin can be re-trained to act ‘younger’ and I don’t mean it in a patronising way. With the help, research and input of Doctor David A. Sinclair PhD, Caudalie harnessed the power of the vine again, particularly resveratrol, which is encapsulated in fatty acids, and put four products into the spotlight. Doctor Sinclair is a Professor of Genetics and according to him ‘the first person who will live 150 years is already born’. The range is recommended for use from the age of 40 upwards and is suitable for most skin types, including sensitive. 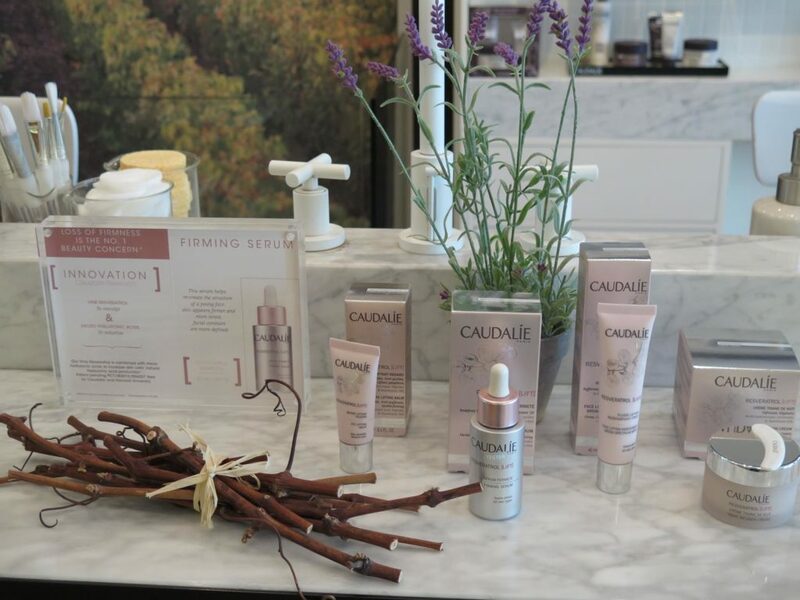 According to Mathilde Thomas, founder of Caudalie, the brand ‘has patented an exclusive anti-ageing blend – stabilised Vine Resveratrol, which improves the entire structure of skin, and a hyaluronic acid complex, which restores volume’. Micro hyaluronic acid complex penetrates the skin and works on deeper skin layers ( consider it a natural facelift in a bottle or an alternative to hyaluronic acid injections ), peptides will help lift the skin from within, as well as assist boosting its own production and Vine Resveratrol will help to resculp the face and neckline, which sadly is a part of the body that gives away our age at a glance. The synergy of those ingredients, together with the infusion of flowers, leaves and fresh herbs , smells like the South of France in the summer. Some of you might find the smell a little too strong but personally I associate this smell with holidays and happiness and really enjoy it on my skin, at times instead of perfume. I have been testing this oil-free serum for seven weeks now and my initial impression was that it feels like a light, lifting mask when you initially apply it to cleansed skin. I have used it under my usual moisturiser during the day and on its own at nighttime and enjoyed the lifting sensation, as well as the light texture, which sinks in quickly. It smells of rosemary, bergamot and hints of lavender, so some might prefer to use it in the evening, to calm the mind, as well as support skin’s rejuvenating process which is at its peak at night. Resveratrol also promises to ‘strengthen’ the skin and I did notice that my face contours looked and felt more defined. A keeper product! This light-textured moisturiser not only offers sun protection but also has soft focus pigments that will add a healthy, subtle glow to your skin. It also works on oily skin, so if you have this skin type, please don’t worry unduly about the shine, as it will act as a good oil-free base for your make-up as well. I have given a few product samples to a friend of mine, who has oily skin, and she was suitably impressed plus observed that she felt that her jawline felt firmer after using this moisturiser for a couple of weeks, twice a day. I must admit that personally I prefer light-textured eye products and this balm has a perfect texture. It is light enough for the warm time of the year but nourishing enough for autumn/winter as well, as our skin requires more comforting textures to make up for the cold outside and radiating heat inside. Caudalie’s plant complex helps address problems of droopy eyelids, while also improving the problem of puffiness. This eye balm is suitable for contact lens wearers, which is a good fact to know, as not all brands mention or take this into consideration. This night cream is quite potent, due to its ingredients but is also quite nourishing thanks to the inclusion of grape oil and organic shea butter. You can use it on its own or if you want a more noticeable effect, I would recommend using the serum, letting it sink in and then applying the night infusion cream, gently tapping it all over your face, starting from the jawline upwards, boosting the circulation and product absorption. I think it would suit mature skin quite well and it is something that I would recommend if you notice lines and wrinkles on your face and would want to improve their appearance. Considering the whole range overall, I am quite impressed with the research that has gone into creating it, as well as combination of ingredients, textures, absorption and effect but do drop by Caudalie’s counter to smell it, as it is quite personal and some might find it a little masculine or a bit too strong. The price point of the range, if you compare it to other luxury products from Estee Lauder, Sisley or Tata Harper, if you prefer a natural alternative in the age-proofing segment, is quite reasonable, so to me this range pretty much ticks all the boxes. I also hope that down the line, Caudalie might introduce a cleanser and toning mist within this range, in order to offer women and men a complete age-proofing routine. I would love to hear your thoughts on it, if you try this range, so please do share your experiences. Will this range manage to turn the frown upside down?